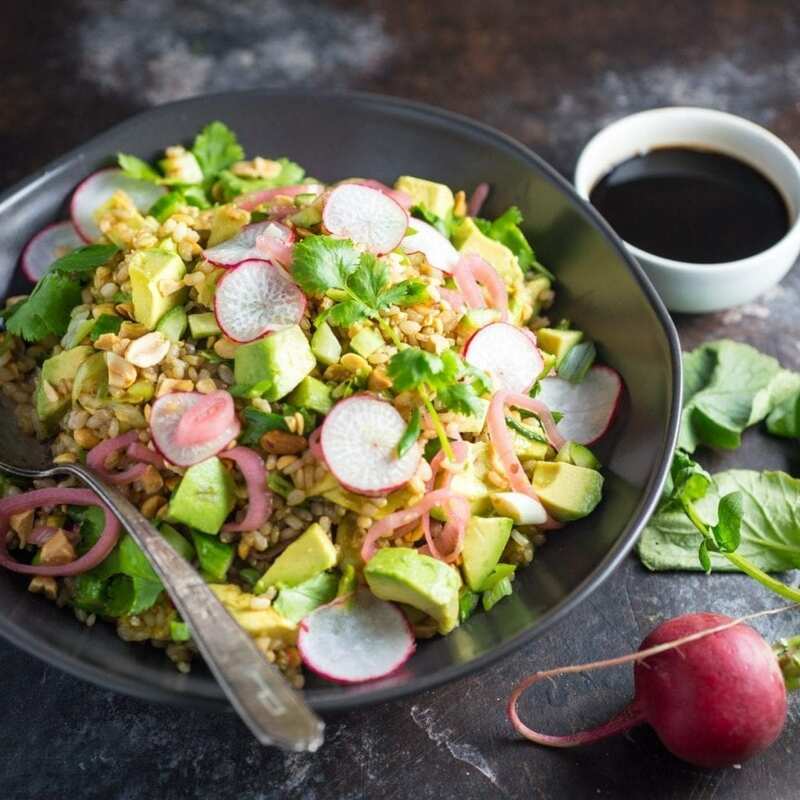 A deceptively simple and delicious teriyaki brown rice salad that can be paired with meat, fish, tofu, or enjoyed by itself. This has been the type of week when I’m so overwhelmed that eating frozen peas straight out of the bag seems like a sensible dinner plan. See, it’s efficient because they thaw as you chew them! Unfortunately Matt thinks this is disgusting and that I should be thoroughly ashamed of myself (pops frozen pea into mouth like a badass). I won’t bore you with the details but I’ll just say this: beginning to edit a new documentary film is a Herculean task and I forget each and every time how overwhelming it is. I’m sure whatever your job is, even if you’re a chef, you have days (months? years?) when having to cook a healthy dinner seems like just too much damn work. I’m here to tell you I get it (I’d point and wink, but I’m just too tired. Please just assume I’ve done it, and I’ll owe you two next time I see you). That’s when you want to have recipes like this Teriyaki brown rice bowl in your back pocket. It’s easy enough to do with half a brain, but delicious and healthy enough to feel proud of yourself. Our favorite crunchy salad vegetables, plus pickled shallots, avocado and roasted peanuts. 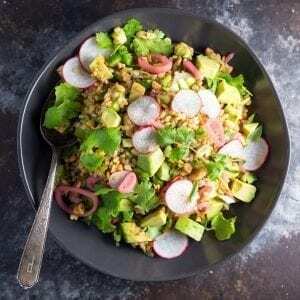 This recipe was inspired by this one by Saveur, and I love the choice of short grain brown rice because it has great texture and a mild, nutty flavor. Other grains like farro or millet would also be good, but they take longer to cook. I like to cook brown rice the same way I cook pasta, in plenty of boiling water. In 30 minutes the rice will be perfectly tender, and all you need to do is drain it and let it cool a little so it doesn’t wilt your vegetables. No measuring, no simmering, and no sticky rice pan to clean. While the rice is boiling, make the simple teriyaki sauce which is nothing more than soy sauce (or Tamari, if you’re gluten free), mirin (sweet rice wine), sake or shaoxing wine and a little sugar. (You can get more information on some of these ingredients on our Asian Pantry Basics page.) While the sauce cools, chop up your vegetables and in a few minutes the whole thing will be ready. I added pickled shallots because I love them (and I made 3 jars of them last week) but don’t fret if you don’t have them. Add any pickled vegetable you want (pickled ginger would be great, or a few pickled peppers) or you could just leave it out. There’s lots of flavor here without it. By itself, it’s a very satisfying lunch but it would be a perfect side-dish to grilled or baked chicken, shrimp or tofu. Now if you’ll excuse me I’m going to take this blanket and this bag of frozen peas and sleep under my desk for a couple of hours before tomorrow starts. G’night! 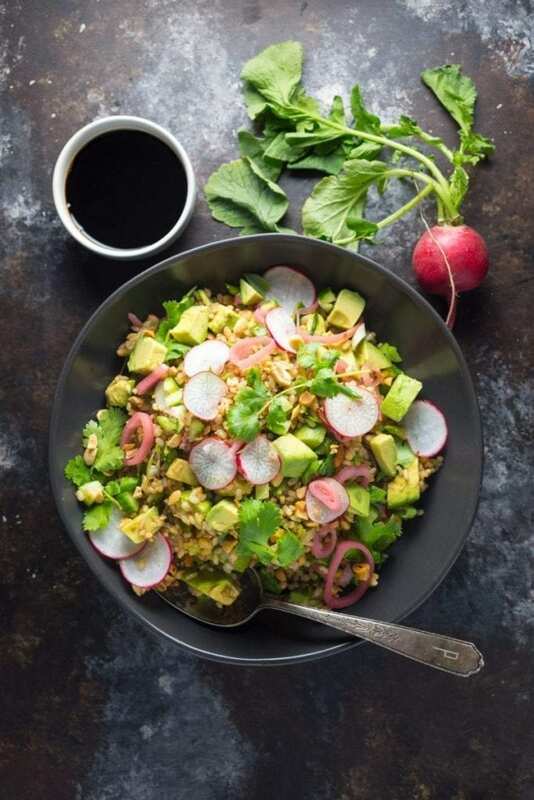 A healthy, hearty grain salad with lots of crunchy vegetables, avocado, and a sweet and salty teriyaki dressing. Rinse rice in a strainer under cold running water for 30 seconds. Bring a large pot of water to a boil in a large pot over high heat. Add the rice, stir it once, and boil, uncovered, for 30 minutes. Drain the rice in a colander; rinse it with cold water and let cool to room temperature. Combine soy sauce, mirin, sake, and sugar in a small saucepan over medium-high; cook until sugar has dissolved and sauce has thickened slightly, 5-7 minutes. Let cool for a few minutes. Combine rice, teriyaki sauce, cilantro, peanuts, shallots, scallions, cucumber, and zest and juice in a bowl; Gently stir in avocado. Transfer to a serving platter and garnish with extra cilantro. i love this brown rice salad. (actually i love anything with avocado)! this looks so so good! Beautiful photos! I really like rice salads. I’ve never had one with Asian flavours though. I’ll put it on the summer need to make list. Thanks!